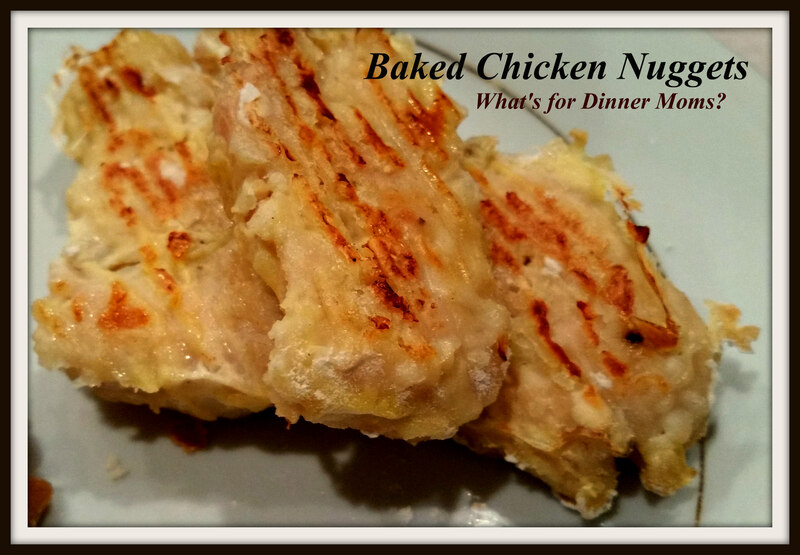 Meal 1 – Baked Chicken Strips – What's for Dinner Moms? Even though I make many “different” meals for my family they still want “kid” food once in a while. I am not a believer in that there are kids foods and adult foods. Kids menus and foods began back in the 1920s because prior to that time most parents dined out without children. Starting in the 20s restaurants began inviting children in but letting it be known that they could not eat what there parents ate. Food was bland and considered good for children’s digestive tracts. It wasn’t until the 1970s that the beige food children’s menu that we know today came into being. By the age of four strong preferences have been developed in what children will eat. If they have not been exposed to bitter, stronger tastes they will take much longer to acquire these tastes. Our pediatrician had us start both children on the bitter vegetables first, peas and green beans, as a child’s natural inclination is to seek out the sweet tastes such as banana and pears. To this day both children eat most vegetables raw and quite a few cooked. I thank our pediatrician for her wise advice. But my children want chicken strips, hot dogs and macaroni and cheese from time to time. If your family is anything like ours, life is busy. I try to make decent food for my family and still try to get it on the table as quickly and easily as possible. This is one of the ways I do it. Cook extra of the meat on one day (since you are already cooking is it really that much harder to add extra?) and use the extra on the second day in a new dish. Or if you don’t want to use it right away freeze it to have cooked meat on hand for another day you will need a quick start to your meal preparation. My partner made the baked chicken strips for us for dinner on a dance night. We had about an extra pound of chicken strips leftover so I packaged them up and planned the next night’s dinner so that no one would know they were eating the same chicken! The were a simple baked chicken strip that we paired with a choice of Country Sweet sauce or barbecue sauce. Add a simple Grandma Brown’s Baked Bean dish with green beans and dinner is done. My partner is NOT a cook and this was a fairy easy dish for her to make. Making enough for two meals added maybe 5 minutes to the prep time and no time to the baking so this meal was a definite win! Preheat oven to 350 degrees. Grease 2 rimmed baking sheets well with olive oil. Mix flour and Morton Seasoning on a large plate or shallow dish. On a second plate or shallow dish beat the eggs. Dip each chicken strip into the flour, then the egg mixture (coating completely) and then the strip to the flour mixture again to coat completely. Lay the strip onto the prepared baking sheet. Repeat step 3 until all strips are coated. Place baking sheets in oven for 12-15 minutes, depending on the size and thickness of your strips it may take a bit more or less baking time. Two or three times during baking turn the strips so they do not stick to the pan and all sides are able to brown. Strips are done when they turn golden brown and are completely cooked through. Serve hot with desired dipping sauces on the side. Thank you! How very kind of you! Yummy! I have to try that next time! I don’t know anyone who doesn’t enjoy a good chicken strip sometimes! Pingback: Meal 2 – Chicken, Bacon, Ranch Pizza – What's for Dinner Moms?